An East Coast snowstorm, Winter Storm Jonas, is expected to produce prolific amounts of snow in parts of the East, rivaling infamous snowstorms of the recent past. While the critical forecast details remain, Winter Storm Jonas has the potential to produce over a foot of snow for tens of millions of residents of the East Friday through Sunday. Some locations may see much more than that. The heaviest forecast total snowfall is in the darker purple and pink contours. "The mechanisms coming together for a major snowfall are textbook," wrote NOAA Weather Prediction Center forecaster and Northeast snowstorm expert, Paul Kocin, in a NOAA forecast discussion Tuesday. Let's explore how this storm may resemble or contrast with infamous snowstorms of the recent past. Then we'll list the top 5 snowstorms of record for several Eastern cities. For the first time, social media helped named this event, and the back-to-back storms definitely lived up to the hype. A swath of 20-inches-plus of snow buried parts of the Mid-Atlantic States including Washington, D.C., Baltimore, Philadelphia, and Pittsburgh. 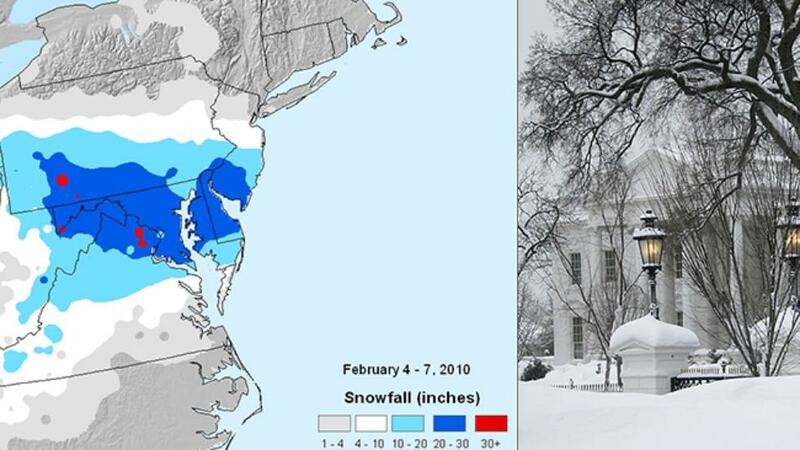 This first Snowmageddon storm (Feb. 5-6) remains the heaviest snowstorm of record at Washington's Dulles Airport (32.4 inches), second heaviest in Philadelphia (28.5 inches) and fourth heaviest in Baltimore (25 inches). Just three days later, another snowstorm pummeled the Mid-Atlantic States, dumping another 10-inch-plus swath from northern Virginia to New York City. After using empty parking lots, city parks and even the Pimlico Race Course, the city of Baltimore resorted to dumping excess snow in the Inner Harbor. Hundreds of thousands were left without power and roofs collapsed in some areas due to the weight of the snow. One-quarter of Washington, D.C.'s snowplows were put out of commission due to the sheer amount of snow to remove. The combination of these two storms, a late February storm and a mid-December nor'easter, shattered seasonal snowfall records in Washington, Baltimore, Philadelphia, Atlantic City in New Jersey, and Wilmington in Delaware. 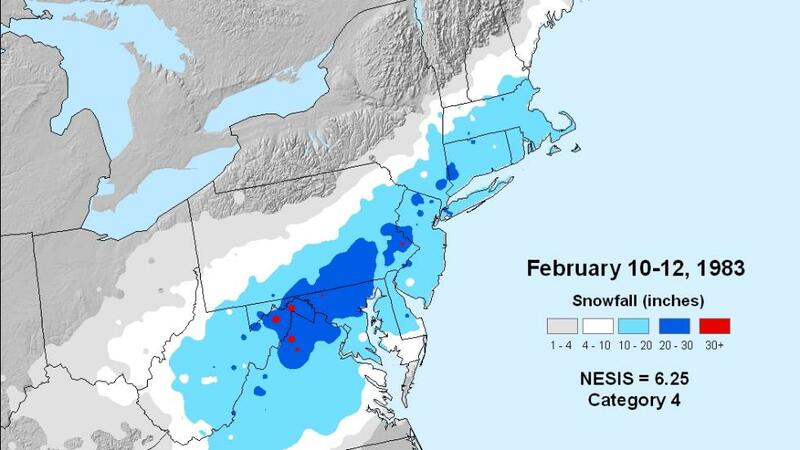 Snowiest month records were obliterated in New York City, Pittsburgh and Harrisburg, Pennsylvania, as well as the Mid-Atlantic locations above. It's worth noting the first "Snowmageddon" storm left out New England, while the second storm days later brought heavy snow to New York, but did little in Boston and Hartford. In a memo on Winter Storm Jonas Tuesday, The Weather Channel winter weather expert Tom Niziol said, "This storm's large-scale weather pattern...is very similar to a storm that pummeled the East Coast with major snow, wind and ice 20 years ago." For the combination of heavy snowfall and high Northeast population, this Jan. 5-8, 1996, snowstorm ranks behind only a February 1969 snowstorm and the "Storm of the Century (March 1993)" events. The extensive swath of snow, paralyzed cities from Washington, D.C. to Boston for days. Strong winds helped to create drifts of five to eight feet deep. Numerous powerlines were downed due to the weight of heavy snow, strong winds and some freezing rain. Some flat roofs collapsed due to the weight of the snow. Overall, a foot or more of snow fell from Kentucky and southern Ohio eastward to western North Carolina and northward into central New England. Two or more feet of snow buried locations from southwestern Virginia through the highly populated metropolitan centers between Washington D.C. and New York City. This remains the heaviest snowstorm on record in Philadelphia (30.7 inches), second heaviest in Baltimore (26.6 inches) and fifth heaviest in New York (20.2 inches at Central Park). Often times, the movie industry fails to give us a sequel that meets the standard set by the original. 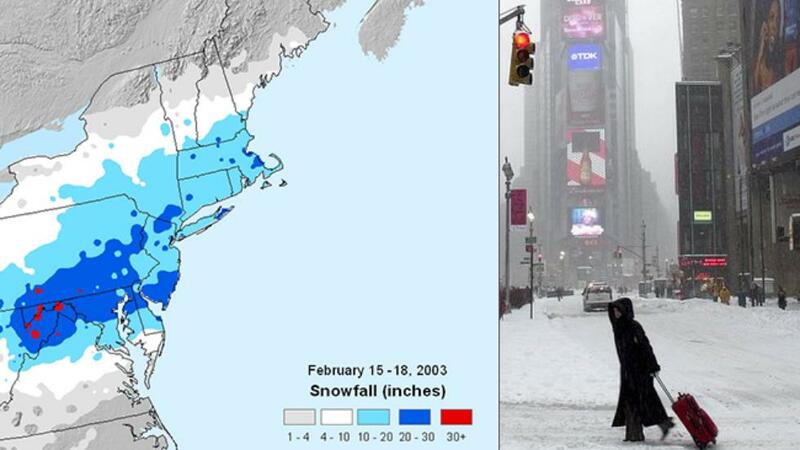 Unfortunately for the Northeast, the so-called "Presidents Day II" snowstorm in 2003 surpassed the original from 1979. The storm's massive 10-inch-plus swath was laid down from Ohio to Delaware to southern New England. This was the heaviest snowstorm to hit the Mid-Atlantic states since the January 1996 storm. In Baltimore, the storm total of 26.8 inches topped the Blizzard of 1996 as the heaviest snowstorm on record. Snowfall rates up to 4 inches per hour clobbered Philadelphia. Roofs and porches caved under the weight of this immense snowstorm, including Baltimore's B&O Railroad Museum. Washington's Reagan National, Baltimore-Washington, Philadelphia, and New York's LaGuardia Airports were all closed. Boston also set a record snowstorm total (27.6 inches), eclipsing the total from the "Blizzard of '78". A state of emergency was declared in Pennsylvania. Stranded motorists were rescued by snowmobile. The University of Maryland system shut down for a full week. Yes, a massive Northeast snowstorm can occur in a strong El Niño winter. One facet to this storm that tipped it into the crippling category was the prevalence of lightning. In this case, these snow thunderstorms produced snowfall rates of 2 to 5 inches per hour from Washington, D.C. to New York City. These are snowfall rates more typical of the Great Lakes snowbelts. Senior meteorologist Kevin Roth was 14 years old at the time growing up in Allentown, Pa. "It was a storm advertised by local media as a whopper for a few days. It hit on Friday and was supposed to start early enough to cancel school, but it was delayed. The snow finally started around 10:45 am and immediately went to heavy snow. We were dismissed from school once all lunch periods were over." Then, Kevin had to get home, somehow. "Normally, my Dad would drive us home after school, but he was on the school district's plow team. We (Kevin's brother, also) only made it about 3 to 4 blocks before we chickened out and called our grandfather to pick us up." The storm would get much worse. Senior meteorologist Stu Ostro was on shift that night. "I'll never forget going on the air live on a New York City radio station and reporting on an observation from Allentown, Pennsylvania, that had just come in, unlike any I had seen before: 'SNOINC 5,' which meant the snow depth had increased five inches in one hour." Back to Kevin Roth in Allentown: "During the late evening the snow really picked up and there were flashes of light and low rumbles. We thought transformers may be blowing from the weight of the snow. Later, we figured out it was lightning! We could barely see the houses across the street." This is still the calendar-day snowfall of record in Allentown (24 inches), and is the fifth heaviest snowstorm of record in Baltimore (22.8 inches), third heaviest snowstorm at Washington's Dulles Airport (22.8 inches) and fourth heaviest snowstorm in Philadelphia (21.3 inches). Below we list the heaviest snowstorms on record in areas that may see the most snow from Winter Storm Jonas, according to data from the National Weather Service. 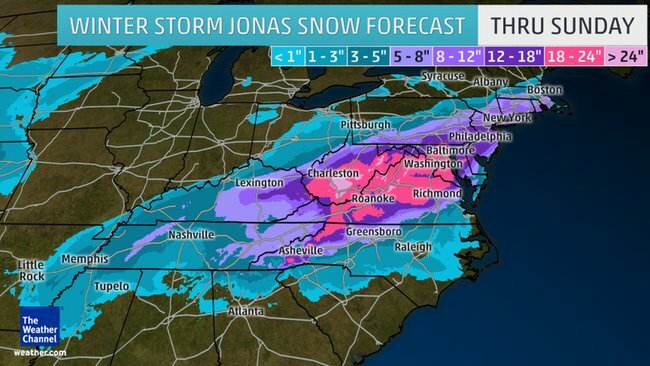 Winter Storm Jonas may break into the top five snowstorms, or even threaten the record heaviest snowstorm in one or more of those locations.